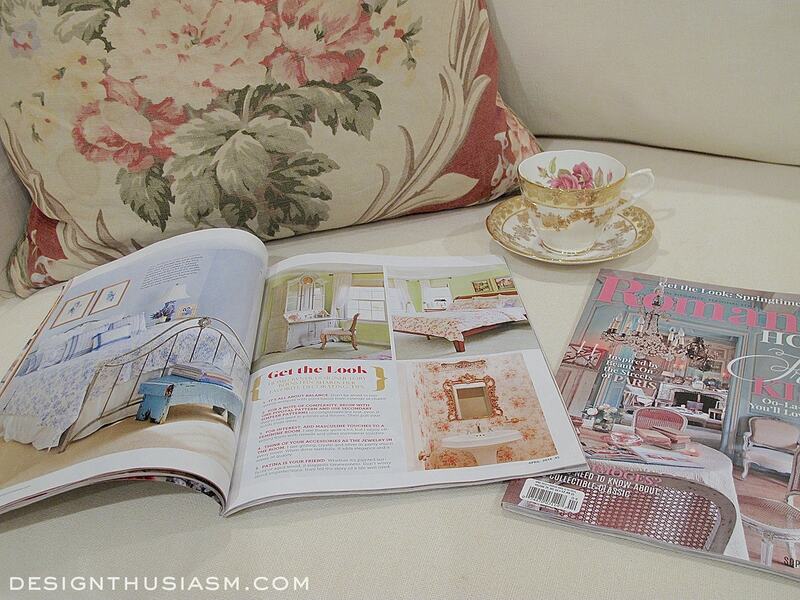 The magazine is Romantic Homes, and Designthusiasm is featured in the April issue, due on newsstands any day now. I received my subscriber’s copy in the mail today and you can see what the cover looks like above if you’d like to locate it to buy one. It’s a wonderful spread, fourteen pages in all, and covers eight of the rooms in my home. The photos were taken by a local photographer, Rikki Snyder, who was just a pleasure to work with. As much as I’m trying to improve my photography skills, it’s a delight to have your home captured by a real pro. The process started several months ago, as we ironed out the details for how the shoot would proceed. I did the styling myself and was interviewed at length by Meryl Schoenbaum, who did a terrific job capturing the spirit of my design perspectives in the article she wrote. It’s actually a superb issue focused on all things French, and a special bonus for me, my blogger friend Cindy from Edith & Evelyn is featured in the very same issue. If you get a chance to pick up a copy, pour yourself a cup of tea, sit back and relax and enjoy a little journey into a French inspired world! Congratulations Lory! Very well deserved, your home is gorgeous! I’ve yet to receive my copy, hopefully it will arrive today! Excited to see it! Well done! Thank so much, Cindy! I’m absolutely delighted to share this honor with you… 🙂 I’ve admired your home for some time, so to see my photo next to yours on the index page is actually quite something!! How exciting, Lory, and congrats!! I will look for a copy. How exciting! I am thrilled for you. Most deserving! Thanks so much, Connie! Appreciate the kind words!! Congratulations, Lory! Very happy and excited for you! Anxious to pick up a copy of the magazine and share it with my friends. . .and thank you for sharing your good news with us! Congratulations Lory! Can’t wait to see the issue…your decor is always so beautiful! LOVE LOVE LOVE this news. I’m going to find this magazine! I love yours posts and the photos you share of your home. I’m not surprised to see that a magazine snapped you up; you are very talented. I love your design, ideas, colors– I love it all! Congratulations Lory—so excited for you! Thank you, Kathy! What a lovely comment… 🙂 It means so much to me!! This is so exciting Lory. I knew you were heading for the “big time” with your extraordinary talents, style and beautiful photography. This could not happen to a more lovely person. For sure I will find this magazine – congratulations!!! Thank you so much, Pat! I’m delighted to share this with my “regulars”… 🙂 Thanks for the support!! How exciting! The photos look beautiful. I will be looking for that magazine today. Btw, Eilis, I checked out your blog too. Your taste is wonderful!! Thanks, Janice!! Enjoy… 🙂 There’s a lot of great stuff in this issue! Congratulations ~ it looks like a beautiful feature! I know this has to be a really big thrill for you, Such a wonderful gift! and french feeling…………….love your work. It will be fun to get to enjoy this special time with you. Blessings……….and keep up the great work!! This is beyond exciting! I’m so tickled for you. I’ll be getting my copy asap. Well done, Lori. I will keep my eye out for a copy. I really enjoy your posts, you are a very talented lady. Wow, that’s so exciting! I’m so happy for you! I’m a new “follower” and I love the inspirations I get for seeing your posts. Oh how VERY exciting for you — and all of us!!! 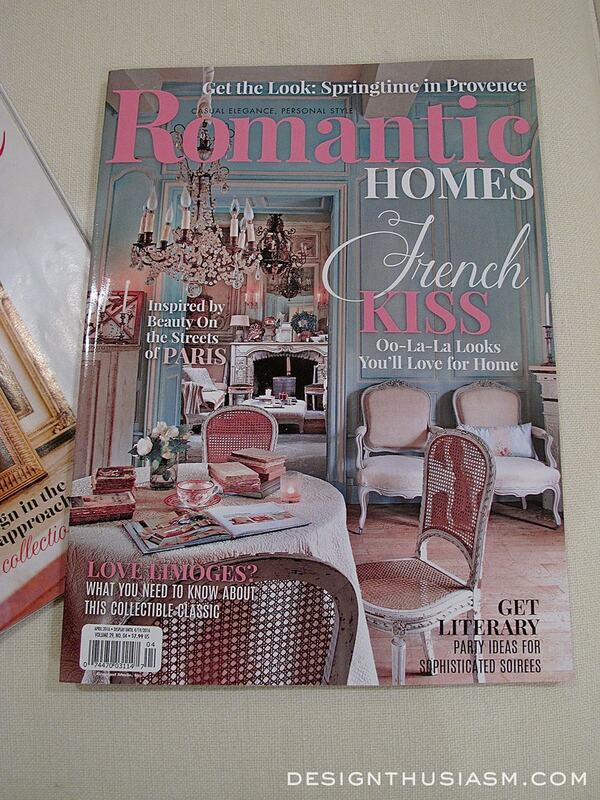 I am on the hunt for my very own Romantic Homes magazine. Congrats to you!!! Congrats! Congrats! Can’t wait till my copy arrives in the post! Congrats how wonderful, you so deserve to be featured your home is beautiful and magazine worthy…. Thank you, Maritza! Feeling very grateful for the honor, but also all the wonderful feedback from my readers!! Good for you!! I know how proud you must be as you should be! Your work is gorgeous and you so deserved this! Congratulations! I always thought your home was so pretty! Congratulations Lori! That is so exciting and I know you are over the moon! You have such great taste, I am not surprised! This is AMAZING!! What an accomplishment! I am sure you are so proud and excited. Your home is very deserving of all the accolades. My first time visiting Lory (via BNOTP) and I can see your home is to die for! Congratulations on the feature. You must be over the moon excited!! Congratulations, Lory! Your home is beautiful! Thank you so much, Lynda!! Lory, I can’t tell you just how excited I am for you. Know you must be thrilled. You’ve worked very hard on your blog and decorating your lovely home, and surely do deserve a big congrats. You go, girl!!!! I’m off to the store to hunt down the magazine. Hugs. Bobbi, Thanks so much! Such lovely words… 🙂 Thanks for always being there to cheer me on!! Congrats!!! I’ve got to get a copy of this one! So excited for you! It looks like an issue I have to get, since it’s French, and you and Cindy are both in it. Woo hoo!!! Let the celebrating begin. Thanks so much, Anita! Yep, I love that it’s the French issue and not only Cindy, but Janet is in it too… 🙂 Btw, thanks for the share, too!! How wonderful! Couldn’t happen to a more deserving decorator. This is really cool stuff Lory!!! I can’t wait to see how far you take it!! Thanks Mariele! I’m actually a relatively new blogger, but thanks for the vote of confidence and kind words… 🙂 It should be available on most any newsstand. What an honor Lori and how exciting for you to be featured in such a fine magazine. I love that you did your own styling. 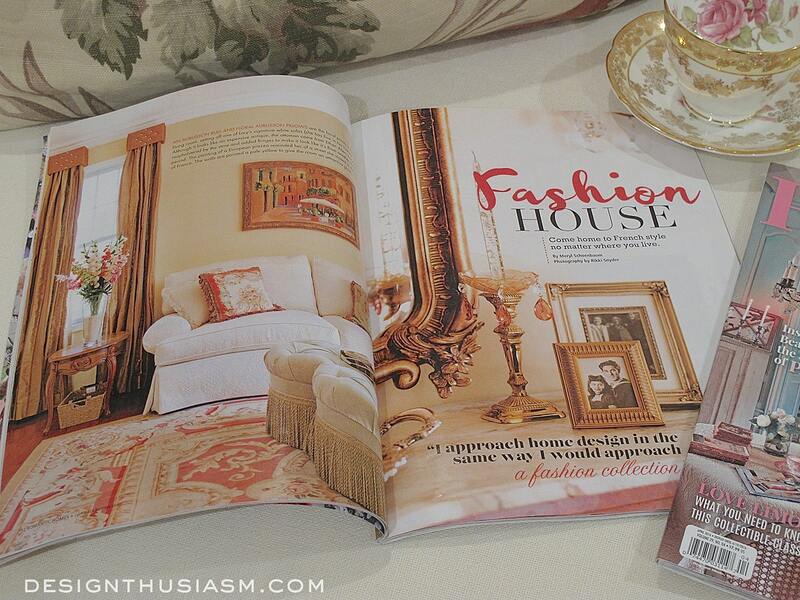 A few years ago our house was featured in a magazine with a 13 page spread. We had two photographers, one for the interior and one for the outside. Even though they brought their own stylist I had everything ready. Nothing was changed nothing was added. It was exciting to watch professional photographers at work. So I know how you feel. 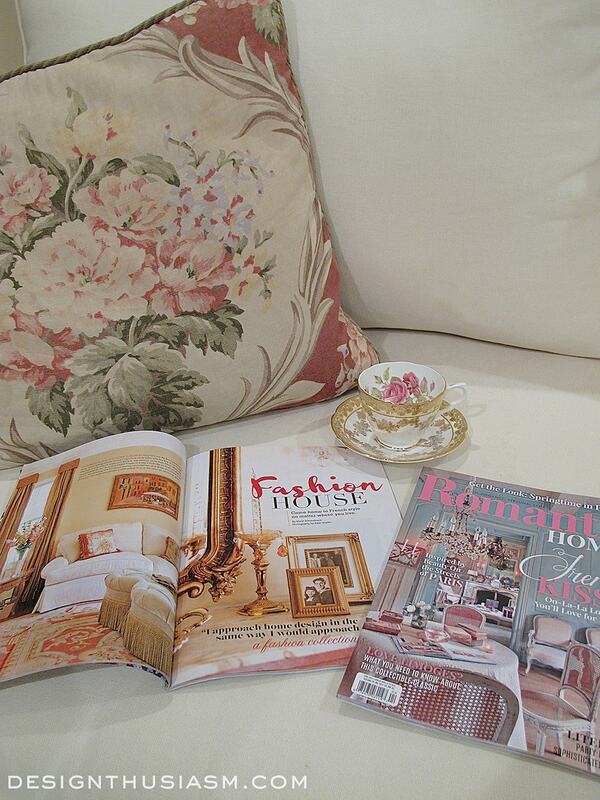 I look forward to the April issue of Romantic Homes. . Thank you, Gina! Sounds like you shared a very similar experience… 🙂 Yes, it was great fun. I’m so chuffed by the wonderful response too!! Congratulations. A very deserved honor. I spent a long time recently going back into your older posts and had a great time. You have excellent taste. Enjoy this. I’m going to get a copy right away. Lory, I’m relatively new to your blog, “DesignThusiasm,” but I’ve commented before and you generously responded to my comment…thank you for that. I love, love, love your blog so much. I’m not surprised that you’d be discovered by one of my favorite magazines as well, “Romantic Homes.” Congratulations, Lory! I look forward to the many more magazine features in your blog future. 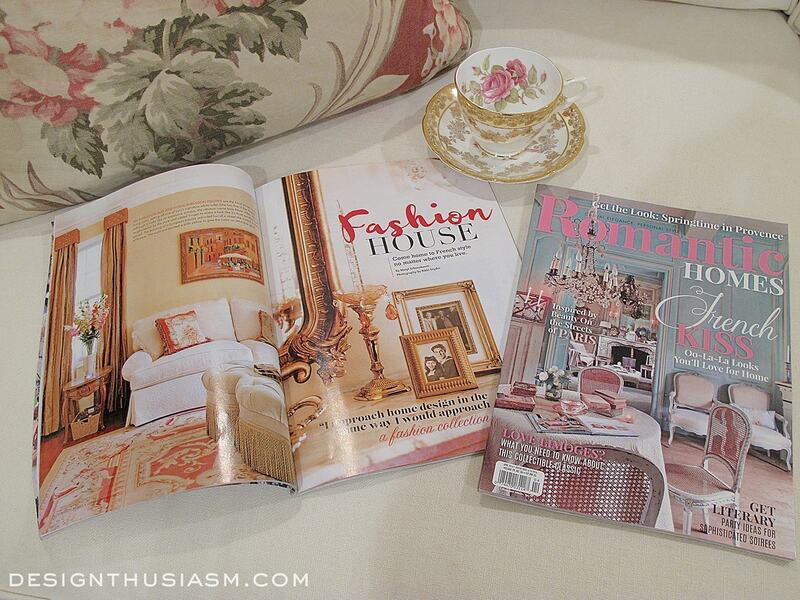 With the April issue of “Romantic Homes,” I feel I’ve hit the Trifecta (though I’m not a horse racing fan, but my father was)…seeing your gorgeous French-inspired home, and Cindy’s from “Edith & Evelyn,” which I only just discovered a few weeks ago. That is exciting Lory! Congratulations! Thanks for sharing at Home Sweet Home! Congratulations, Lory! 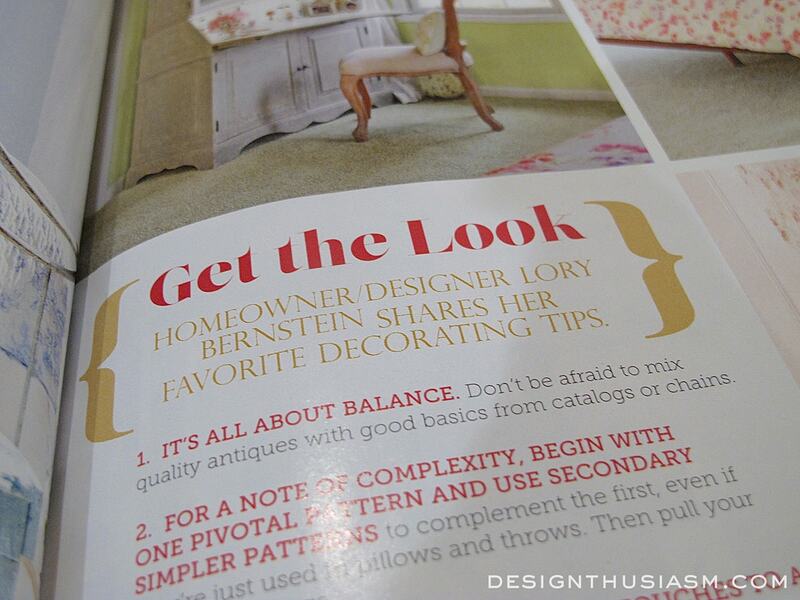 How great to have such a large article and so many of your rooms featured in the magazine! I can see from the “sneak peeks” that you showed that you give good tips on how you achieve your look. I will certainly be on the lookout for the magazine so I can buy one. Oh my goodness!!! What a thrill and so well deserved. Being in a magazine was on my bucket list before I knew what a bucket list was. I can’t wait to find your issue on my newstand. And I’m going to go back and read all your old posts while I’m waiting. Congrats my friend.